Given that so many people want to learn a great deal about new types of wines these days, it can be frustrating when the marketing people want to dumb things down and continue to tell us about the same products again and again. So it was nice to receive an email from a wine company, asking me if I was interested in tasting three examples of Grenache; even better was the fact that they were from three different countries: Spain, France and the United States. Naturally, I said yes to the offer; it was a nice way to learn about this lovely variety. Grenache - or Garnacha - as it is known in Spain - is a variety that delivers wines with moderate tannins, good acidity and often a nice assemblage of brown and red spices. It's not the big, super ripe style of red you might be used to from Cabernet Sauvignon or a Shiraz from Australia, so prepare for that. Wines made from this grape tend to be subdued with a nice earthiness that makes them wonderful partners for stews, lighter games, certain preparations of duck and other similar dishes. The majority of plantings of Grenache is in Spain (Garnacha Tinta is the official name here) and the version I tasted was the 2010 offering called The Show from Calatayud in the northeastern sector of the country. Bright crimson in color, this has inviting aromas of raspberry, clove, mulberry and nutmeg - there's a group of aromatics you won't find in most red wines!. Medium bodied, this has tart acidity, modest tannins and good persistence, while the finish has a pleasing subtle spiciness. While I'd like a bit more punch at the end, a bit of food, such as a pork chop or meat stew will help complete this wine. Also I can't criticize a wine as well made as this for $13. This is a delighful version of Grenache and it certainly offers a lot of character for the money (especially when compared with most examples of Malbec at the same price). The second Grenache I tried was the 2010 Shatter from the France's Roussillon area in far southern France. This wine is a collaboration between California winemakers Joel Gott and Dave Phinney. It's medium-full with intriguing aromas of cooked meat, myrtle, plum and Queen Anne cherry; this has slightly richer tannins along with more obvious oak. This nicely displays the sensual, earthy side of Grenache; it's also a bit bold and has a bit too much oak influence. This can be enjoyed now, but it will be better in 3-5 years. It's priced at $30 and while the price is not extravagant, I'd would have liked to see this come in some $5-$7 less, which would make this wine more appealing to a lot more people. Fall is here and cold weather is coming, so why not try Grenache for something different with the heartier meals you'll be enjoying? These wines are represented by Trinchero Family Estates of St. Helena, CA. Whenever I taste the wines of Pine Ridge Vineyards, it's like old home week for me. I recall tasting the initial release of their 1978 Rutherford Cabernet Sauvignon and throughly enjoying the classic style of this wine, one that displayed admirable balance along with a nice sense of place. Here was a new Napa Valley estate that could stand alongside some of its more famous neighbors. Over the past twenty years, I've enjoyed many wonderful wines - white and red - that were crafted under the leadership of founder Gary Andrus. A former Olympic skier, Andrus was a kind-hearted man who was always a positive thinker, one who foresaw greatness - and realized it. Gary befriended me early on and I recall him giving me a big bear hug at a restaurant in Napa Valley one evening, this after not seeing him for a couple years. I loved this guy like a brother, so I was shocked to hear the news a few years ago that he had passed away. I don't recall the circumstances, but he was much too young and had too much untapped energy to devote to his winery. Thankfully the winery has maintained their high level of quality after Andrus' death, as Stacy Clark continued to fine tune and improve on these wines, especially the district series of Cabernet Sauvignons. These wines, from Pine Ridge estate vineyards in Rutherford, on Howell Mountain and at their winery plantings in the Stags Leap District in southern Napa Valley, are the signature offerings of the company; they're classy wines that really speak of their origins. Balance has always been the key with these wines, which is one big reason why I have always loved these offerings so much. For me, bigger isn't necessarily better - in fact, it generally isn't better at all. 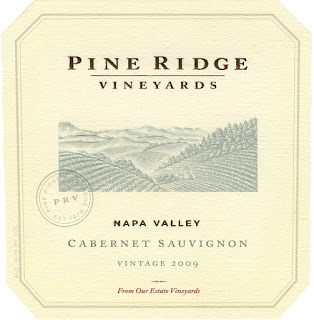 What impresses me is varietal character and elegance, two characteristics that define the Cabernet Sauvignons of Pine Ridge. Today, Pine Ridge is guided by Michael Beaulac, who serves as general manager and winemaker; he joined the winery in 2009 after working in the California wine industry since 1989. The recent 2012 harvest was his 23rd in northern California. Beaulac's first efforts with Pine Ridge Cabernet Sauvignon have been released over the past several months of 2012. I'll get to these shortly, but let me first tell you about the 2011 Chenin Blanc / Viognier, a delightful dry white that has been a bit of an innovation for the winery. Early on, Andrus produced a Chenin Blanc from a top grower in Napa Valley, but when that fruit became unavailable, he sourced Chenin Blanc from the Clarksburg area. This was always a nice effort, off-dry with tasty melon, apple and lime fruit. But soon, Viognier was added to the blend (the fruit comes from the Lodi district in central California) and the wine took on an added dimension. 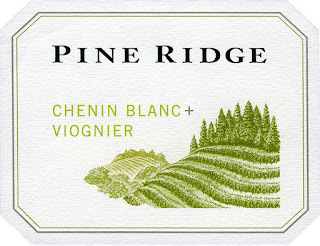 The 2011, a melange of 79% Chenin Blanc and 21% Viognier, is a lovely wine with an appearance of straw and just a hint of copper; the aromas are quite inviting with perfumes of lime, honeysuckle (clearly from the Viognier) and magnolia blossoms. Medium-bodied with very good concentration, this has beautiful ripeness, very good acidity and a flavorful, nicely balanced finish. This is a delicious wine that was given no oak treatment, so as to heighten the aromatics and varietal charms of the two varieties. This is refreshing and very appealing; the winery recommends this with a flavorful Thai curry or a sushi dish such as a spicy tuna roll and I'd be hard pressed to think of a better pairing. Best of all, this retails for $14, which makes this a notable value, given not only the complexity and elegance, but also the amount of character in this bottle for not much money. Congratulations, Michael! I've saved the best for last. The winery's Stags Leap Cabernet Sauvignon has always been a favorite of mine and in reality, this wine expresses this producer's concept of Napa regionality as well as any of their products. This is 100% Cabernet Sauvignon, which is somewhat typical of the Stags Leap District, which yields wines of softer tannins than those from Howell Mountain or Rutherford; there are textbook aromas of morel cherry, raspberry, purple iris and a touch of vanilla. This has a generous mid-palate, excellent persistence, silky tannins, good acidity and notes of sweet chocolate in the finish. This is a beautifully balanced wine (I know, this sounds like a broken record with this producer's Cabernet Sauvignons) with signature supple tannins as well as notable varietal purity. Up in heaven, I'm sure Gary Andrus is proud of what the proprietors of his winery have accomplished; that is, if Pine Ridge wines are served in heaven. If not, God is missing out on some great wine!